To Solsten on the "Ships starting with S" page. This external site has a picture of Solsten. Built by Barclay, Curle & Co., Ltd., Whiteinch, Glasgow in 1929. I've been told that the captain of this ship during the war was Fridtjof Rafen (who also served on Ada) according to an E-mail received from his nephew, Karl-Henrik Froböse, who also sent me the pictures of the convoy clock used by Solsten. 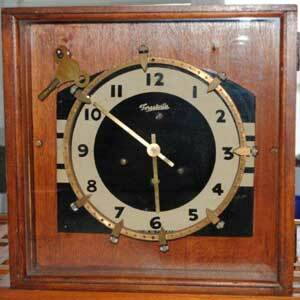 The pointers around the clock face are movable, and were set to the time intervals of a ZigZag pattern. As the minute hand progressed it made contact with the appropriate pointer, which triggered a bell or buzzer. The helmsman then made the necessary alteration of course. Each ship in the convoy, supposedly, was synchronised, and each ship altered together. In the Convoy Instructions were a number of Zig-Zag patterns. Instructions would have been issued for the pattern to be used. This info was received from Phil Morgan, who adds, "To counter the suggestion of it being a CONVOY CLOCK, I recall an old hand telling me that it was not the practise to Zig Zag in convoy, only when sailing independently. Convoy Clock or Zig Zag Clock were terms used; it was used for ZigZagging. He points out the obvious perils of trying to get a large number of ships altering course at short intervals within such close proximity. Zig Zag patterns were numbered and shown in Convoy Instructions. Prior to sailing, ships would be given details of procedures to take in the different circumstances that could arise." 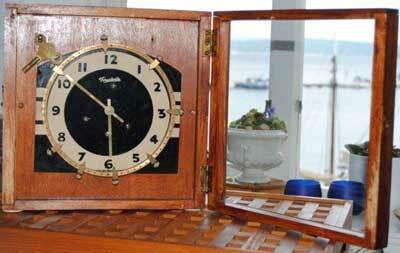 I've also received an E-mail from another visitor to my website who says these clocks were used in both world wars and the purpose of them was to coordinate previously determined course alterations while the ships' radios were silent, or when there was no visual contact with ships in the same convoy, for instance because of fog. Follow the convoy links provided for more information on each (please be aware that some of the listings may be incomplete). Where the "Convoy" column is left blank, it means that convoy is not known. May 13 New Orleans Bermuda May 22 Independent See also narrative below. June 18 Clyde   OB 170 For Aruba. Jan. 30 Loch Ewe   OB 279 Dispersed 62N 23 10W, Febr. 2. Apr. 15 Milford Haven   OG 59 Detached Apr. 22. May 31 Bermuda portion joined main convoy Halifax June 3* HX 129 *Page 1 gives arrival June 1. June 6 Halifax Liverpool June 22 HX 131 Missing movements, Page 1. Sept. 24 Sydney, C.B. Belfast Lough Oct. 10 SC 46 Convoy will be added. Dec. 31 Loch Ewe   ON 52 Dispersed Jan. 11. May 24 Freetown Liverpool June 16 SL 111 11 Mails. Sept. 4 Sabine Bar Key West Sept. 8 HK 100 Sabine Bar to Key West. Sept. 8 Key West New York City Sept. 13 KN 200 (Again, compare w/Page 2). Oct. 17 Liverpool Oban Oct. 19 ON 140 Convoy will be added. 1943 May 18 New York City Boston  Independent Page 3 gives arrival May 20. June 16 Clyde New York City July 1 ON 189 Convoy will be added. Aug. 27 Loch Ewe New York City Sept. 9 ON 199 Convoy will be added. Dec. 5 Loch Ewe Liverpool Dec. 7 Independent Missing 1943 movements, Page 4. 1944 March 13 Liverpool   ONS 31 Convoy will be added. May 11 Liverpool Philadelphia May 27 ON 236 Convoy will be added. July 12 New York City Brownsville   Page 4 gives arrival July 22. Stop at Key West not mentioned, Page 4. Aug. 13 Hampton Roads Puerto la Cruz   Page 4 gives arrival Aug. 23. Then freighting in Gulf of Mexico. When war broke out in Norway on Apr. 9-1940, Solsten was on her way from Takoradi to Trinidad, where she arrived on Apr. 16 - see Page 1. Having made a voyage to Baton Rouge, she headed to Bermuda, joining the Bermuda portion of Convoy HX 45 on May 23 (she had been scheduled for the previous convoy on May 19, HX 44, but as will be seen when going back to the archive document, she did not arrive Bermuda until May 22). She had a cargo of petrol for Ardrossan, where she arrived on June 11. A week later she shows up, with destination Aruba, in Convoy OB 170, which originated in Liverpool on June 18 and dispersed on the 23rd, Solsten arriving Aruba on July 7 (having joined from Clyde). Finnanger and Ørnefjell are also listed - ref. external link provided in the Voyage Record. From Aruba, Solstad proceeded to New York a few days later, remaining there for several weeks; departure is given as Sept. 10, when she sailed to Halifax, where she also had a long stay, before proceeding to Sydney, C.B. on Oct. 28. Another month was subsequently spent there; she had been scheduled for the slow Sydney (C.B.)-U.K. Convoy SC 11 on Nov. 9 (in which Bruse and Salonica and several others were sunk - follow the links for details), but did not sail and does not show up again till Convoy SC 14 at the end of that month, bound for London. According to A. Hague, she later joined Convoy OB 279, which originated in Liverpool on Jan. 28-1941 and dispersed Febr. 2 and also included Beduin, Buesten, Kristianiafjord, Madrono, Norefjord and President de Vogue. No destination is given for Solsten, but from Page 1, we learn that she arrived Aruba on Febr. 21, having started out from Loch Ewe on Jan. 30. She returned to the U.K. in March with Convoy HX 113, again joining from Bermuda. On this occasion she had a cargo of gasoline and kerosene and was bound for Milford Haven and Plymouth, taking station 42 of the combined convoy, arriving Milford Haven on March 22, Plymouth on the 24th. Together with Bjørkhaug, Fernlane, Hjalmar Wessel, Ila and President de Vogue, she now appears in Convoy OG 59, departing Liverpool on Apr. 15, arriving Gibraltar on the 28th. Solsten, however, was bound for Aruba again, where she arrived on May 9 (she had started out from Milford Haven on Apr. 15). A. Hague says she detached from the convoy on Apr. 22 in order to proceed to this destination. (OG 59 will be added to an individual page in my Convoys section, but for now, see ships in all OG convoys). She joined the Bermuda* portion of Convoy HX 129 later that month, but did not follow this convoy all the way to the U.K. She's said to have put back to Halifax on June 1, later joining Convoy HX 131 from there on June 6, bound for Manchester with gasoline in station 62. * See also cruising order & notes for HX 129, where she's crossed out even from the Bermuda portion, but this may simply mean that she did not join the main convoy(?). According to Page 1 she did leave Bermuda on May 25, but put back to Halifax on June 1. The following month, we find her, with Bello, Belita, Geisha, Havprins, James Hawson, Marit, Ørnefjell, Salamis, Selvik, Tanafjord and Vigsnes, in Convoy OB 345, which left Liverpool on July 11 and arrived Halifax on the 26th; again, ref. external link in the table above. Her destination is not given, but going back to Page 1, we see that she arrived New York on July 28, again remaining there for several weeks, before proceeding to Sydney, C.B. on Sept. 18. According to Arnold Hague, she now returned across the Atlantic with Convoy SC 46*, which departed Sydney, C.B. on Sept. 24 and arrived Liverpool Oct. 10 (Solsten, cargo of aviation gas, stopped at Belfast Lough). Several Norwegian ships took part, namely Alaska, Bestik (returned), Bonde, Bruse Jarl, Fidelio, Gezina, Loke and Senta. Later that month, Solsten can be found in station 34 of the westbound North Atlantic Convoy ON 30, which originated in Liverpool on Oct. 26 and dispersed on Nov. 9. Her destination is given as Halifax, where she arrived on Nov. 11, having started out from Milford Haven on Oct. 25 (via Belfast Lough) - see Page 2. The Commodore's narrative is also available for this convoy. Already on Nov. 16 she's listed as returning to the U.K. with the slow Convoy SC 55 from Sydney, C.B., subsequently joining the westbound Convoy ON 52*, together with Brasil, Bello, Kaia Knudsen, Katy, Morgenen, Mosli, Nyholt, Stigstad, Thorshøvdi, Tungsha and Vanja. Montbretia and Rose are named aong the escorts (see ON convoy escorts). Solstad arrived Galveston on Jan. 29-1942, having sailed from Loch Ewe on Dec. 31 (the convoy had been dispersed on Jan. 11). In Febr.-1942 she was in Convoy SC 72, which departed Halifax on Febr. 28 and arrived Liverpool on March 17; but Solsten again stopped at Belfast Lough, later proceeding to Avonmouth, with arrival March 21 (she may have been cancelled from the previous convoy, SC 71, but not sure). About a week later she's listed as bound for Aruba in the westbound Convoy ON 81*, arriving Aruba on Apr. 20, the convoy having been dispersed on Apr. 9 - Polarsol, Thorshov (Commodore Vessel) and Thorshøvdi are also listed. From Aruba, Solsten proceeded to Freetown (Page 2), and A. Hague now has her in station 83 of Convoy SL 111, which departed Freetown on May 24 and arrived Liverpool on June 16. Other Norwegian ships included are Havkong, Sandanger, Skandinavia and Petter II. In the middle of July that year she joined the westbound Convoy ON 113*, as did Abraham Lincoln, Evita, Harpefjell, Norsol, Pan Aruba, Salamis, Thorhild and Vav. Solsten was bound for New York, where she arrived on Aug. 2. There's an article about this convoy available via the external website that I've linked to at the end of this page. According to this article, Solsten disrupted an attack from U-552 "with accurate gunfire which forced 'a sharp blast of air' in the faces of the sub's bridge crew". Harpefjell is also mentioned in the article, which has a lot of details on this convoy. ON 113 had departed Liverpool on July 17 and lost 3 ships, namely the British Broompark, Empire Rainbow and Pacific Pioneer, while British Merit was damaged. A. Hague later has Solsten in Convoy SC 102*, departing New York on Sept. 19-1942, arriving Liverpool Oct. 6 - Aragon (to Halifax only), Aun, Bestik, Borgfred, Fjordheim, Nea (returned), Norvarg, Orwell and Solitaire (returned) are also named. From Liverpool, Solsten continued to Eastham and Manchester, with arrival the latter on Oct. 8 (Page 2), later joining the westbound Convoy ON 140* (departure Liverpool Oct. 17, arrival New York Nov. 7) - her destination is not given, but according to Page 3, she did not cross the Atlantic on that occasion. It'll also be noticed that she later spent quite a long time at Tyne. She shows up again, with destination New York, in Convoy ON 148*, which left Liverpool on Nov. 23; Solsten arrived New York on Dec. 14, having joined from Loch Ewe. Far, Inger Lise, Ramø (returned to port), Don, Herma (joined from Iceland) and Ada (joined from Halifax) are also listed in this convoy. There's now another long gap in her voyages; her departure New York is given as May 18-1943, when she proceeded to Boston, then on to Halifax, and from there she joined Convoy SC 132 to the U.K. on May 26, arriving Clyde on June 11, heading back across the Atlantic a few days later with Convoy ON 189*. She arrived New York on July 1, having started out from Clyde on June 16 (Gallia, Glarona, Kong Sverre, Roald Amundsen, Solør and Troubadour are also listed in this convoy, while Acanthus, Potentilla and Rose are named among the escorts - see ON convoy escorts). She went back to the U.K. again at the end of July with Convoy SC 138 from Halifax. In Aug.-1943 she's listed as bound for New York with Convoy ON 199* (convoy left Liverpool on Aug. 26, arrived New York on Sept. 9; Solsten had joined from Loch Ewe - Cypria, Haakon Hauan [returned], Høyanger, Kaldfonn, Kronprinsessen, Molda, Norma, Spinanger and Stiklestad are also listed). On Oct. 11 we find her in Convoy SC 144 from Halifax, arriving Liverpool on Oct. 27, and as will be seen when going back to Page 3, she headed to Iceland the following month, visiting misc. ports there before she on Dec. 1 joined Convoy RU 99 back to the U.K. Her destination is given as Manchester, cargo of herring oil - according to Page 4, she arrived Manchester on Dec. 13/14. She subsequently had a long stay in Liverpool, where she had arrived on Dec. 16 - departure is given as March 13-1944, when she headed back to New York. For this voyage, she sailed in Convoy ONS 31*, which arrived Halifax on the 30th - Grey County is also listed. As already mentioned, Solsten was bound for New York, where she arrived on Apr. 1. Later that month, she joined the slow Convoy SC 157 from Halifax (her destination is given as Modewheel; going back to Page 4 of the archive docs, we learn that she arrived Manchester, via Liverpool and Eastham, on May 1/2), subsequently returning with Convoy ON 236*, which also had Buenos Aires, Fjordaas, Montevideo, Norholm, Norvarg, Rena, Sommerstad, Thorshov, Titanian and Vera among its ranks; departure Liverpool May 11, arrival New York May 27 - Solsten arrived New York, via Delaware Capes, on May 30. Just 3 days later, she's listed as bound for Heysham in the New York-U.K. Convoy HX 294, for which Abraham Lincoln served as the Commodore Vessel, while the Vice Commodore was in Geisha. Solsten arrived Heysham (via Belfast Lough) on June 19, returning across the ocean with Convoy ON 242*, which originated in Liverpool on June 25 and arrived New York July 11. Ferncliff, Fernmoor, Fjordheim, Havkong, Marit II, Molda, Peik, Samuel Bakke (Vice Commodore), Skiensfjord, Solstad, Stirlingville, Tercero, Thorshov and Vera had also been in company. Page 4 and Page 5 list the rest of her 1944 voyages. Convoy information to match some of these can be found in the Voyage Record above. Page 5 also shows some of her early 1945 voyages, while Page 6 has her voyages up to and including Apr.-1946 (this document indicates that she went home to Norway in Dec.-1945, but arrival there is not mentioned). * The ON convoys will be added to individual pages in my Convoys section in due course, along with further details on each. In the meantime, the ships sailing in them (and escorts) are named in the section listing ships in all ON convoys. ONS 31 is also available - see this page listing ships in all ONS convoys. Note also that the entire SC series will be updated and completed (including the already existing convoys - some have already been updated), but for now, see ships in all SC convoys. According to this external page, she was sold in 1951 to Norness Shipping Co. Inc., Monrovia and renamed Jenny Naess. Sold to the U.K. for breaking up in 1954. The Battle for Convoy ON 113 - A very detailed description of this convoy battle (a section of Rob Fisher's Home Page). Back to Solsten on the "Ships starting with S" page. Rafen & Loennechen had another Solsten post war, built in Glasgow 1954 - the Clydebuilt Ships website has some details on this ship. The text on this page was compiled with the help of: "The World's Merchant Fleets 1939", Roger W. Jordan - and misc. other.